The first part of this post dealt with weathering the sides of CWE 62827 and can be found here: http://cwerailroad.blogspot.com/2015/08/back-at-it.html. Now it's time to weather the top and apply some more weathering to the ends, bottom and trucks. I used the same brushes and paint for these next steps as I did to weather the sides. Below is a picture of the brushes and the paint. For the top, I mixed the same Liquitex Ivory Black and Titanium-zinc Everwhite oils with a little bit of Winsor & Newton burnt sienna. I thinned this into a wash with odorless turpenoid and the applied it to half of the roof with the brush on the left above. I made sure to get the wash under the running board and around the sides of the hatches. Next, I took the brush on the right above and began stippling the wash. As the brush accumulated paint, I would wipe it on a paper tower. Every so often, I would dip the brush into turpenoid and then wipe it almost dry on the paper towel. The photos below show the results. The most important part of this step is to soften any sharp edges by continuing to stipple the wash very gently. It takes a bit of time but the results are worth it. Adding a very little bit of turpenoid to the brush can help loosen any of the wash that has begun to set up. Also, be sure to stipple the areas around the base of the hatches. The wash tends to accumulate here and needs to be softened up. To add some additional color to the roof, I mixed some more of the burnt sienna into the wash and then gently stippled this on around the roof hatches to represent additional grime and rust. This wash was also applied to the running board at this time. The photo below shows the results. At this point, I sealed the weathering on the roof with a light coating of Dullcote. Once this had time to dry, I started on the ends and outlets. The first step on the ends was to make up a wash similar in color to the one used in the second step on the roof. I stippled this very lightly on each to represent the grime that gets thrown up from the wheels. Next, I stippled the same wash on the bottom of the hopper bays on each end where the wheels would throw up grime. Lastly, I stippled this wash randomly to the sides of the outlets. The photo below shows the results. After another application of Dullcote, I started on the trucks. I mixed up the same wash used on the sides and applied it to the side frames using the brush on the right in the first picture above. I wiped the brush almost dry on a paper towel and then stippled the side frames. Once this had dried, I added some AIM weathered black powder around the journal boxes. Next, I mixed up some artist's acrylic ivory black and Windex and added some AIM weathered black powder. This was applied to the wheel faces and the coupler trip pin. The last step will be to add some more rust/grime around the coupler boxes and inner wheel faces and axles. I'll also hit the coupler with some weathering. Stay tuned. 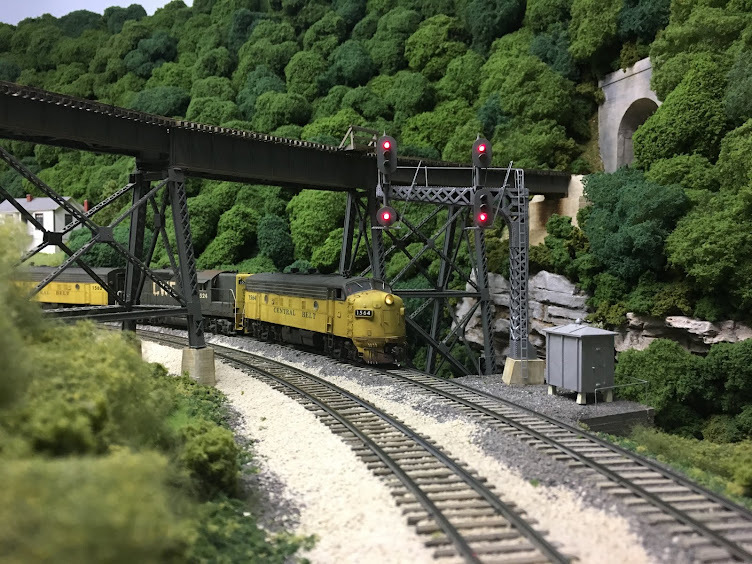 This past January, I stopped over at Matt Snell's house to drop off some parts for the bicentennial unit he was building for the railroad (http://cwerailroad.blogspot.com/2015/02/bicentennial-unit.html). He showed me a business car that he was working on and asked if the CWE could use one. After thinking about the offer for about a nano second, I said sure. I told him that a business car was another one of those projects that I had thought about from time to time and had planned to do one day, but there were so many other pressing projects that it may never happen if it was left to me to do it. It was another month or so before I heard from Matt again about the business car. He asked if I had thought about a paint scheme for it. After some back and forth on possible schemes and my initial ill conceived idea of something in Pullman Green and UP Armor Yellow, I decided on the same basic color that NS uses today for its executive train. Fast forward to this past April. Matt brought CWE 1 to the GLA operating session on Jim Rollwage's Denver Pacific. The photo below shows the car heading east through Henderson, CO to be delivered to the CWE. Matt developed the paint scheme, detailed the car, and then painted and lettered it before releasing it the railroad. During an op session in May, we catch CWE 1 on the back end of MTNM-6 as it heads east through Summit Springs. Later in the summer, the car was captured at Hollister Yard in North Pirece, WV. The shot below shows all of the detail on the roof and the observation platform of the car. What you can't see in any of these shots is the incredible interior detail that Matt added. And in the last shot below, we catch CWE 1 as it heads west out of North Pierce. This car is absolutely beautiful in every respect and is another testament to Matt Snell's creativity, craftmanship and generosity. Thanks again, Matt. Well, it's the middle of August and the summer is winding down. The trips to Michigan are over. Now it's time to get back at it. There are a number of projects currently in the works, many of which were put on hold when the summer first began. 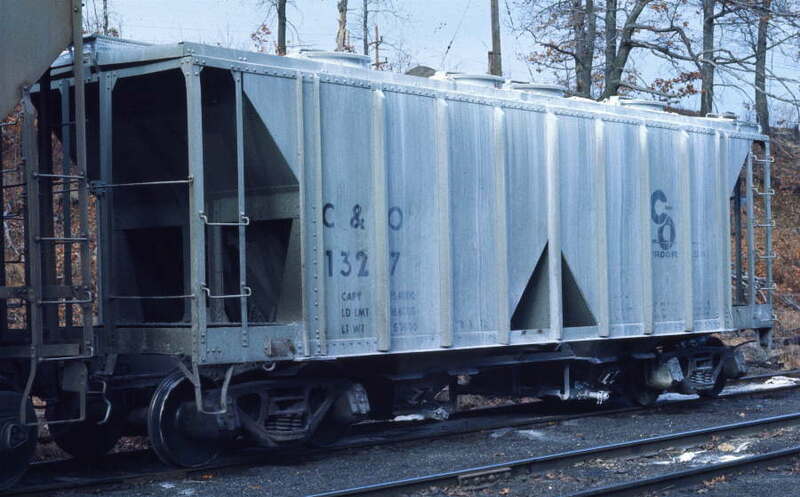 One of these is a Kadee covered hopper car that I painted for the home road this past spring. It's been sitting in the paint shop awaiting weathering ever since. 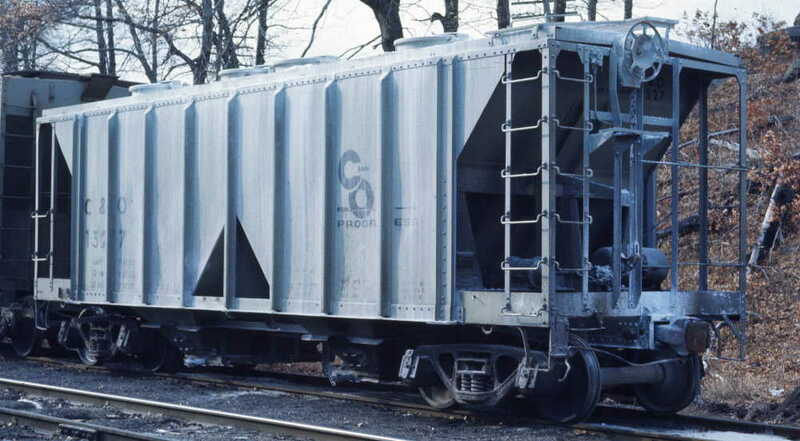 I've been studying two photos of C&O 1327 taken by Carl Geffchen in 1973. Here's a link to the photos on George Elwood's Fallen Flags website: http://www.rr-fallenflags.org/co/co-l1327akg.jpg and http://www.rr-fallenflags.org/co/co-l1327bkg.jpg. Notice the darker streaks on the sides that have been created by the rain as it washes dirt and grime down the sides. This was the look I wanted to capture on the first coat of weathering and it finally struck me as to how to go about it. First, I mixed up a light grey color using Liquitex Ivory Black and Titanium-zinc Everwhite artist's oils with a little bit of Winsor & Newton Burnt Sienna added. I thinned this into a wash with odorless turpenoid. The photo below shows the grey color along with the three brushes I used. Next, I took the brush on the left above and applied the wash to several panels on the side of the car. Once the wash had begun to set, I took the brush in the middle and started pulling it down the side from top to bottom. The middle brush has an extremely rough edge and this helped produce the individual streaks. I also used a block of wood held against the car side as a guide in order to get straight vertical lines. As the brush with the rough edge accumulated some of the wash, I wiped it clean on a paper towel. I was careful to keep this brush as dry as possible in order to avoid smearing the streaks. The photos below show the results. After completing several panels, I went back and took a cosmetic sponge wet slightly with turpenoid and removed the wash from the ribs. Next, I applied the same wash to the ends and bottom of the car using the third brush from the left in the picture above. Once the wash was on, I cleaned the brush and then went back and stippled the wash in order to remove some of color and soften the edges. The shot below shows the effect. The photo above shows several areas where the wash could be softened up a bit more. I'll address that with the next coat of weathering. But for now, I'll spray the car with Dullcote in order to seal this layer of weathering. Once the Dullcote has dried, I'll start on the roof. More to follow on this project.